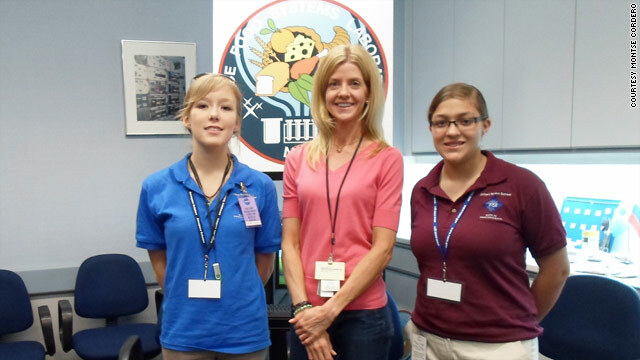 Montse Cordero, right, with housemate Alex Carney, left and a NASA employee at Johnson Space Center's Space Food Systems Laboratory. Our morning started with a tour of the food lab at Johnson Space Center before school. The Space Food Systems Laboratory (SFSL) is the place where they design, prepare and package the food astronauts will eat in space. Our tour through it was quite brief, but interesting. We saw the old ways they would prepare food and how they have changed the process to make it easier and safer for the astronauts. We only have one more day of actual work at space school, so today was intense and critical. We started our school day with a presentation on the possible uses for the International Space Station as a stepping stone for future exploration. Our speaker presented interesting ways of using the ISS to get to Mars, the moon, near Earth objects, and other places. After some working time, we had a speaker talk to us very briefly about exoplanets, explaining the different ways to find them. To finish with our talks for the day, we had one about space law given by a mentor, and even though it didn’t directly affect our responsibilities, it was really interesting. After school we had a game night at the university. We got to play board games, card games and pingpong. It was a really fun opportunity to get to know each other a bit better and to recharge batteries for the long, long day we will have tomorrow. Oh, but see, since a big zombie oeuartbk would invariably involve a celebrity death or two, we'd all hear about it all over the place. Well, I guess I won't.Damn.